For other people named John Stockwell, see John Stockwell (disambiguation). John Stockwell Samuels IV (born March 25, 1961) is an American actor, director, producer, writer and former model. Stockwell was born John Stockwell Samuels IV in Galveston, Texas, the son of an attorney. Stockwell's sister is historian Evelyn Welch, and his niece is singer and songwriter Florence Welch. He began his career as international model, spending much of his time in Italy. During his time as a model, John became a friend of Andy Warhol. His first feature film as an actor came with a small role in 1981's So Fine. His well-known roles came in the 1983 comedy film Losin' It as Spider; later that year, he starred in the John Carpenter horror film Christine as Dennis Guilder, and the 1985 comedy film, My Science Project as Michael Harlan. Also in 1985 he appeared in the poorly received City Limits; though unsuccessful at the box office, the film was later riffed in an episode of Mystery Science Theater 3000. In 1986, he appeared in Top Gun as Cougar. He made guest appearances on TV shows including The Young Riders and Friday the 13th: The Series. 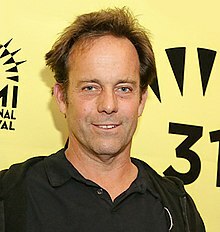 Stockwell directed several films, including Cheaters (2000), Crazy/Beautiful (2001), Blue Crush (2002), Into the Blue (2005), Turistas (2006), Heart (2009)., the Gina Carano star-vehicle In the Blood, and the 2016 Kickboxer reboot Kickboxer: Vengeance. Stockwell also wrote the screenplay for the 2001 film Rock Star. Stockwell is married to Helene Henderson, a chef and caterer. They have three children. ^ "John Stockwell Biography (1961-)". Filmreference.com. 1961-03-25. Retrieved 2012-07-26. ^ "Biography at Yahoo! Movies". Movies.yahoo.com. 2011-04-20. Retrieved 2012-07-26. ^ "Florence Welch on Her Fear of Treadmills, Lady Gaga, and 'Ceremonials' | SPIN". 2011-11-21. Retrieved 2016-07-21. ^ Warhol, Andy (1991). Pat Hackett (ed.). The Andy Warhol Diaries. Warner Books. ISBN 978-0446391382. ^ Holden, Stephen (August 10, 1985). "FILM: 'SCIENCE PROJECT,' FROM JONATHAN BETUEL". The New York Times. Retrieved 2012-06-05. ^ "Turistas (2006) - Cast and Crew at Visual Hollywood". www.visualhollywood.com. Retrieved 2016-07-21. ^ Suter, Lesley Bargar (August 25, 2015). "How Helene Henderson Turned a Malibu Tourist Trap into a Food Empire". Los Angeles Magazine. Retrieved 6 July 2017. ^ Baboujon, Betty (June 8, 2005). "A Swedish Summer". Los Angeles Times. Retrieved 6 July 2017.